In these times of global crisis, how can we use the power of dialogue? Is it possible to use the power of human communication to cope with, and hopefully avert, some of the worst effects of the planetary crisis we are now facing? What can exchanges using language and ideas, dia-logos, contribute toward addressing the challenges of climate change, financial meltdown, resource depletion, and protracted conflicts, among others? 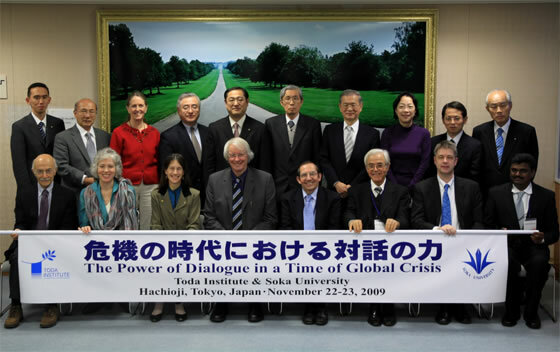 To try to answer some of these questions, the Toda Institute held an international conference entitled The Power of Dialogue in a Time of Global Crisis at Soka University in Tokyo, Japan, on November 21-23, 2009. Experts from around the world gathered for three days and exchanged ideas on a wide range of topics including the North/South dialogue, the pitfalls of narratives focusing on a clash of civilizations, human wisdom from ancient India to contemporary philosophy, the power of listening and of compassion, and many other subjects related to the main theme.